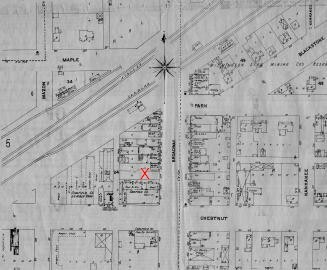 With literature such as "Theory of Economic Development" and "Purchasing Power of Money," in 1911, it is no wonder that the idea of a need for a bank sprung up in Coal City, after the private bank of Emory D. Scott closed. So, in November of 1911, an application was sent to the Comptroller of Currency in Washington, D.C. The application was signed by William Campbell, a mine superintendent; Warham Short, a farmer; John Trotter, a farmer; William G. Suffern, a merchant; and Henman Smith, a lawyer. These men sent the application in for formation of The First National Bank of Coal City. The total amount invested in this project was $25,000. 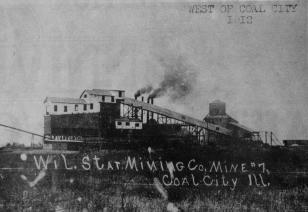 At that time, population of Coal City was 2,667. On the twelfth day of December, 1911, the letter from the Treasury Department came which approved the application. The original signers of the application became the first Boad of Directors for the new bank. This is one of the mines that first bank president, William Campbell, supervised. Campbell was a mine superintendent for Wilmington Star Mining Company which operated seven mine shafts in this area. Lettie K. Young was the first actual employee of the bank in Coal City. Lettie was hired in 1912 and she worked there until her death in 1922. Lettie Young was a cashier when she died. After she was gone, J. Harvey Thornton was appointed to fill her position. Not only was it extraordinary that she attained such a high position, it was interesting that she was not only the only employee for several years, but that she was a woman. The records show that as of June 12 of 1912, at the first Board of Directors meeting, the bank was becoming quite popular. There was an increased amount of transactions. Altogether, 28 loans were approved through the bank by June. The largest loan was for $2,500, and the smalled loan totaled $15.00 By the first Board of Directors meeting, a total of $8,615 had been approved. At that time, the president of the bank was William Campbell, who remained in office for 25 years, until 1936. Lettie Young was the bank secretary, and Warham Short was the director and vice president. Soon after the first board meeting, Warham Short died and at 3:00 p.m. on July 12, 1912, Dr. Frand Stockdale was appointed director and John Trotter became vice president. During the first year of operation, another employee and machinery, as well as land acquisition, were added to bank assets. The new employee was Hugh Bennett. Bennett was hired as assistant cashier in December of 1912, at $50 a month. He was only with the bank until May of 1913, when he resigned. W.G. Suffern took his place. New machinery came from the estate of Emery Scott. The bank received/purchased two vault doors, one manganese safe, and various other bank equipment. In October of 1912, the first adding machine was purchased from Burroughs and the development of a long standing bond between Burroughs and the bank was formed. (The bank still currently uses all Burroughs computer equipment.) The land acquisition was for lot 12 in the 24 block of Coal City. The land was purchased from Coal Field Coal Company for $1,200 and was to become the next site for the new bank. Through November and December of 1912, the bank was paying $10 per month rent for their existing building until the construction of the new building was completed. This is a city map of Coal City in the early 1900's. The bank is pictured at 24 on Broadway. (The red X.) Much of the same structuring for the town remains today.